Okay… my favourite place in New Zealand? Too hard! There are too many wonderful options. So, let me tell you about my perfect day. 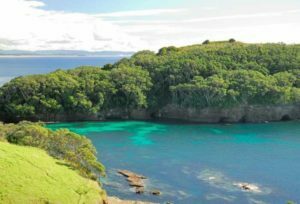 It starts with a 1.5-hour trip north of Auckland to Goat Island for snorkelling in the marine reserve there. It’s stunning and so easy to find (just turn off towards Leigh once you hit Warkworth on State Highway 1 Northbound). The fish there are huge and the water is crystal clear. But if snorkelling or diving is not your thing, then I’d go to Tawharanui Beach, which is just around the corner. Again, this place is stunning. The beach has gentle 1-2-foot waves which are great for a body surf. After chilling out (or warming up) and soaking up the sun, I’m off back to Leigh for fish’n’chips. Better yet, I might swing by the Leigh Sawmill for a cold beer, a platter of yummy food and a chance to see one of the local live bands play on stage there. They sometimes bring in some superb headline acts, classic kiwi bands like ‘Fat Freddy’s Drop’, ‘Sola Rosa’ or ‘Katchafire’ From there, I’m heading north again, probably to Mangawhai Heads for the night (another 45 minutes away). There are several camping grounds located around the estuary there, but I’m there for the beach, another stunner, with a nice right-hand break which can get up to 6-foot. This place is world renowned for kite surfing also. And as I lay back in my Escape campervan and watch the stars, I know tomorrow is going to be fantastic also because I’m now just a couple of hours from Paihia and the Bay of Islands (some of the best fishing in the world). Yep, all of this within a few hours of Auckland City. New Zealand really is the world in miniature! This is a hard choice, so I’m going to do two. The first is Kerosene Creek, just 25kms from Rotorua on the highway to Taupo, you’ll see it on the left. About 1 km from the main trunk highway you will find a gravel car park, and in front of you a pathway down beside the river. 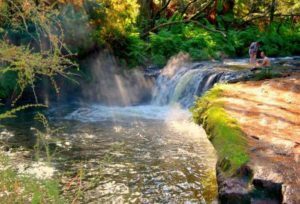 This river is a hot water river, and about 200 metres down the path you will find a large open picnic area beside a waterhole and waterfall. This is a beautiful spot for a day trip or picnic in your Escape campervan (though probably not the best place to camp as I don’t remember any toilet facilities! ), so jump in the waterhole and get a back massage from the waterfall, it’s just brilliant! It’s also in the middle of native bush so there are plenty of walks to do in the area. My 2nd choice is Arthur’s Pass National Park, right in the heart of Arthur’s Pass. Here you will find 3 DOC sites all within 50kms of each other. The Whites Road site is probably my favourite as there’s a river, lovely campsites, and a multitude of bush walks. Also, you are very likely to run into park rangers in this area who are friendly and very approachable, with lots of local knowledge. You will also find unlimited deadwood for your campfire, as it is in the heart of some of the nicest natural bush in the country. I hope you enjoy. My favourite place is a small Central Otago town where I grew up. It has a population of only 5,500 (minus me of course!). When I tell people where I’m from, many have either never heard of it or have never been there. The summers are always hot and Lake Dunstan is full of people out in their boats having a good time. You will most probably spot my brother out their towing people on their water-skis behind his boat; if you dare to ask him he just may take you out as well! The winters are the opposite of course, with the temperature some days reaching into the minus figures – awesome for the skiers among us. Queenstown is a 50-minute drive away and Wanaka is just 30 minutes, so if you’re road tripping in a campervan, you’re never too far away from the ski fields in winter. So where in Aotearoa am I talking about you ask? Well my favourite place is where most of my family still live: Cromwell! 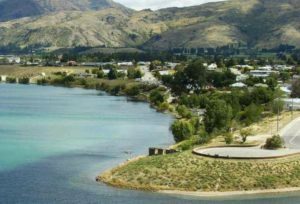 You’ll find it nestled between State Highways 6 and 8, so you’ll pass right by if you’re either coming down the West Coast or coming inland from Omarama on the Inland Scenic Route heading towards Queenstown. Drop in to the “Fruit Bowl of the South” and find out about its viticulture, horticulture and gold mining history! My favourite place would have to be Doubtless Bay nestled along the lovely east coast in the winterless north. Beautiful colonial style villages set on bay upon bay of white sandy beaches and a real local kiwi hum to the place. 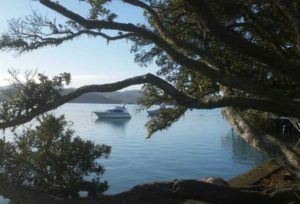 It has all the attraction of the Bay of Islands without the tourist driven feel plus the best ‘fish and chips’ in NZ! If you’re backpacking New Zealand in a Escape campervan, it’s a place not to miss!